They're a close knit family with a strong bond. And the Dyer family rallied together to treat the matriarch of the group, Joanne Mas, 42, as they headed for lunch together on Mother's Day. 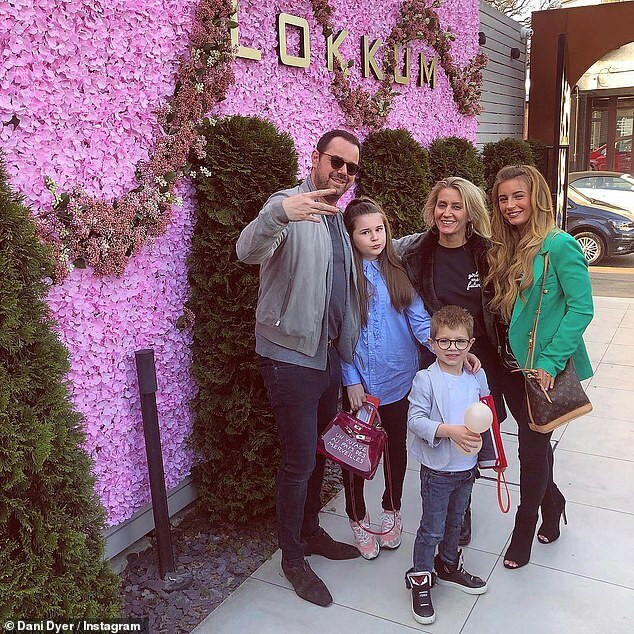 With EastEnders star Danny, 41, leading the way, he was seen heading into the Lokkum Bar and Grill in Woodford alongside the couple's three children Dani, 23, Sunny, 11, and Arty, five. Looking in high spirits, Love Island winner Dani cut a chic figure in an emerald green blazer layered over a pair of skinny jeans. The reality starlet boosted her frame with a pair of suede peeptoe heels, whilst she accessorised with a Louis Vuitton handbag slung over her shoulder. Dani completed the look with a satin marble effect blouse that she tucked in to accentuate her tiny waist. Showing where Dani gets her stunning looks and figure from, Jo also looked phenomenal as she headed for lunch. The financial adviser showcased her youthful physique in a leather mini skirt that was tucked into a fitted black top. With her tanned and toned pins on display, Jo shunned heels in favour of sensible yet stylish black ankle boots.